Excellent choice. 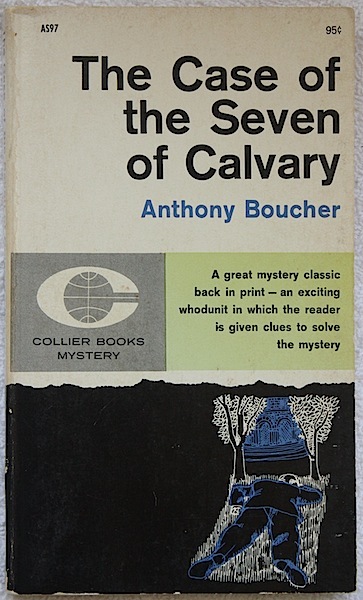 All of Boucher's books are clued with plenty of esoterica. I'd recommend all of Boucher's books, especially the Sister Ursula ones. I was able to get a hardcover (signed by the author, no less) at a reasonable price. Thanks for stopping by, Jeffrey. Quite a coup for you that signed copy! I've all of his novels but TCOT Crumbled Knave. 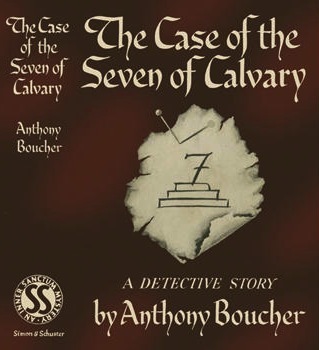 I sold the two hardcover copy Boucher books I had - neither had DJs. Slowly reading them all now that I only have cheap, beat up reading copy paperbacks. NINE TIMES NINE is one of the most outrageous of the impossible crime novels out there. I very much enjoyed TCOT SOLID KEY when I read and reviewed it for my blog last year. But this one was very different I thought and much better. Sounds great John, thanks for that. I've got a paperback omnibus from the 80s that includes this (edited by Maxim Jakubowski for the Zomba Books imprint) but haven;t read it yet. I liked NINE TIMES NINE quite a bit, but then with all its references to Ellery Queen and John Dickson carr I could hardly fail to!